Your policy will be custom tailored to your unique situation, goals and dreams, and there is no set amount you need to put in to start a policy. As a general guideline, plans funded with a minimum of $250 a month grow more efficiently, and you can put in as much money as you wish (the upper limit is determined by your income and assets). In some situations, cleverly reducing debt will allow you to use the dollars freed up for your policy. There are a half dozen ways to do this, which can free up a significant amount of monthly cash flow to help fund a policy that could help you achieve your goals as quickly as possible. Find out why Bank On Yourself is even better than debt free. Many people find money to finance their policy by backing off on funding their 401(k) or other retirement accounts, and continuing to pay only the amount that their employer matches. This brings them the guarantees, tax advantages, and flexibility Bank on Yourself provides that their traditional, government-sponsored 401(k), IRA or pension plan does not. It lets them stop playing retirement-plan poker and have the peace of mind that a predictable retirement income stream brings. If you have been building an emergency fund in a savings or money market account, a policy designed to maximize the power of the Bank on Yourself concept can also serve as an emergency fund, so you may want to consider opening a policy and moving some of your current savings into it. The return of a Bank On Yourself policy beats the interest rates of savings and money market accounts and CDs – without increasing your risk. Some people love getting a big tax refund check in the mail every year. But that’s your own money you’re getting back. You’re giving the government an interest-free loan, while getting a zero rate of return on your money. It’s fast and easy to adjust your withholding, immediately increasing your monthly cash flow (in some cases by hundreds of dollars a month), and you could then use those dollars to fund your policy. 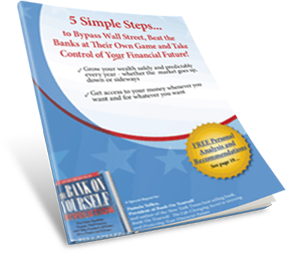 To learn more about how Bank On Yourself works, request our FREE Special Report, How to Safely Grow and Protect Your Wealth, Even When Stocks, Real Estate and Other Investments Tumble. One option to consider that could enable you to start a plan sooner is holding onto your car a few years longer than you normally would and holding off on buying a new one. It’s also easy to cut monthly costs through simple changes like eating out less, and bundling your Internet, cable TV, and phone services. Take the first step today and take back control of your financial future! Unfortunately, many people never discover these pitfalls until it’s too late! You may find that you can restructure your mortgage, or stop making extra payments of principal, and free up more seed money to help fund a policy, so you can move closer to a secure financial future. That is not to suggest that you use your home equity to directly finance your lifestyle, or that you use your home as an ATM, as it’s been referred to in recent years. This will not get you the desired result. But if you put those dollars into the kind of policy recommended for the Bank on Yourself concept, you could then borrow your equity in the plan to make major purchases, paying your loans back to your plan, so you recapture the interest you now pay to outside finance companies… and so you can ensure you have a worry-free retirement. When you request a free Analysis, you’ll get a referral to one of only 200 financial advisors in the country who have met the rigorous training and requirements to be a Bank On Yourself Authorized Advisor. The advisor will look at your overall financial picture to find creative ways in which you may be able to fund a bigger policy than you thought possible… sooner than you thought possible, sometimes with little or no increase in your out-of-pocket cost. Are there any fees or commissions involved? Bank On Yourself Authorized Advisors (life insurance agents with advanced training in this concept) do not charge fees to prepare an Analysis or to design your policy. If you decide to implement it, the Advisor would receive a commission from the insurance company, which has already been taken into account in the bottom-line numbers you will see when you request your no-obligation Analysis. Much like buying a flat-screen TV or a couch, all the costs of “manufacturing and sales” are already included in the price – or, in this case, in the insurance premium. There are no hidden fees (unlike the many undisclosed fees you have with a 401k plan). Also keep in mind that the commission Authorized Advisors receive is reduced by 50 – 70%, because at least 50 percent of your premium is typically directed into a Paid-Up Additions Rider that turbo-charges the growth of your cash value in the policy, but pays the Advisor virtually no commission. Take the first step today and take back control of your financial future! More than 500,000 people are enjoying these benefits today because they have rejected the conventional financial “wisdom” and are now in control of their financial well-being. Bank on Yourself was established in 2002 to educate Americans about this powerful way to have a rock-solid financial plan, with no luck, skill or guesswork required.